Captain America Marvel Video Slot Guide & Review - Casino Answers! 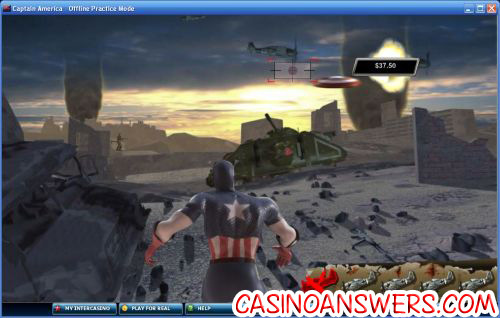 Captain America is a 5-reel, 3-row, 25-line video slot based on the popular Captain America Marvel Comics series. It has scatter symbols, wild substitutes, a bonus game feature and three progressive jackpots. It is part of the Cryptologic Marvel Jackpot series and can be played at InterCasino. Bets available on the Captain America slot machine are $0.01, $0.02, $0.03, $0.04, $0.05, $0.10, $0.15, $0.20, $0.25, $0.50, $0.75, $1, $2, $3, $4 or $5 per spin. This gives you a lot of choice on how much you want to bet. We advise that you bet as much as you can on all 25 lines per spin, as the more you bet on a spin, the greater your chances are of winning a progressive jackpot (more on that later). Regardless of the progressive jackpots, I found first-hand that if you bet a lot, you tend to win a lot. 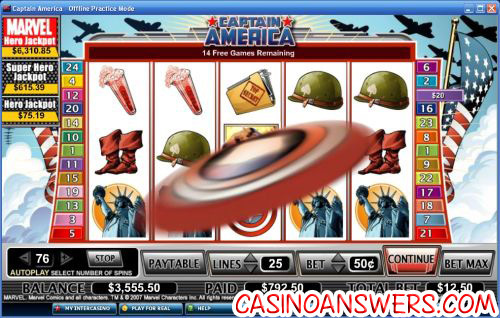 As it is a Marvel Jackpot Slot, Captain America is linked to three Marvel jackpots. At the time of writing this video slot review, the Hero Jackpot is at $115, the Super Hero Jackpot is at $1,075 and the Marvel Hero Jackpot is at $10,500. All three jackpots are grow at a rapid pace, so they may double or triple before they are won. The Marvel Jackpots are won frequently, so don’t put it into your mind that you can’t be a lucky winner on the Captain America video slot. Captain America has a bonus game feature. It’s triggered when you have three or more scatter logos appear on a spin. There are a bunch of planes flying overhead, and you must choose which one you want Captain America to throw his shield at. The plane blows up, and you win a prize. If you happen to blow up Red Skull’s plane, all of your prizes will be doubled and you will win 15 free spins. You cannot retrigger the bonus game during your free spins. The free spins will be played at the lines and bet of your triggering spin. Prizes will be multiplied by your triggering bet. The bonus game and free spin prizes will be added to your line and scatter wins. Captain America is a fun Marvel Jackpot video slot with lots of chances to get some big wins (as shown above). We recommend you head over to InterCasino and take advantage of their 100% up to $225 signup bonus so you can have $450 to play Captain America and several other Marvel Comics and DC Comics video slots. I’m a US-based player. Is there an online casino where I can play the Captain America Marvel Jackpot slot machine? Regretfully, none of the Cryptologic casinos where you can find the Captain America slot machine game are accepting players from the United States at the moment. However, you can find a lot of other excellent video slots at Vegas Technology online casinos such as Millionaire Casino. Is there a Captain America Marvel Slot Machine? What marvel slot machines are there? Is there an Avengers video slot?